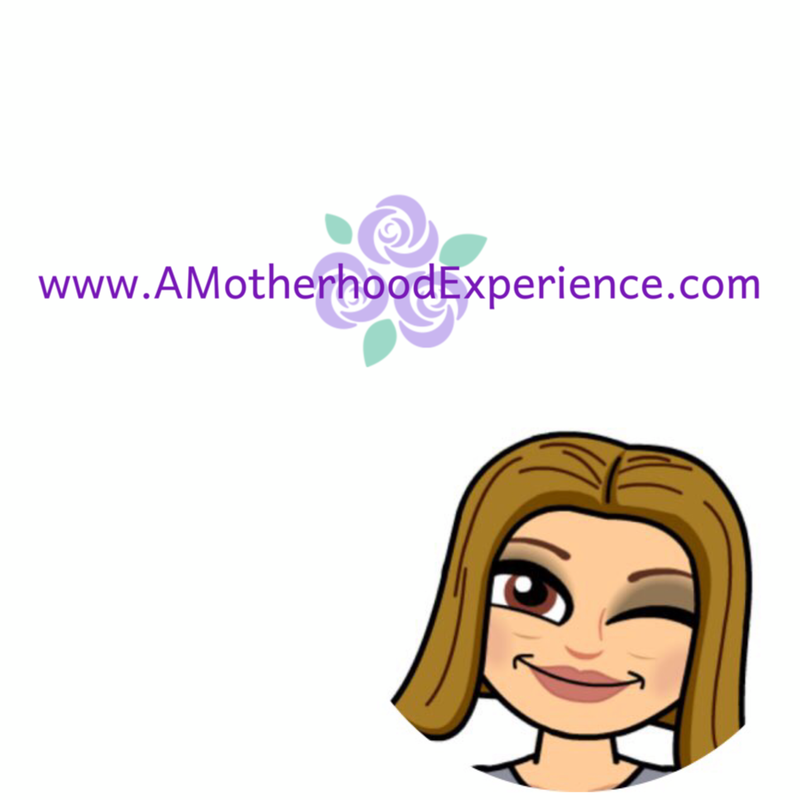 Ever have one of those mommy-moments when you wish you had an extra set of hands to handle at least ONE task while everything is going on around you? Feeding time is a special bonding time between baby and mother but most moms can admit there are times where we have one of those mommy-moments when you wish you had an extra set of hands to handle the bottle for you. 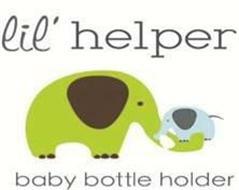 When I came across the Lil' Helper Bottle Holder I thought this was a great idea. The Lil' Helper Bottle Holder is just like an extra set of hands to help you hold the baby's bottle in position to feed when you have your hands full. Lil' Helper is made with BPA-free plastic and is a parent approved diaper bag essential! Great idea to add to a baby shower gift too! 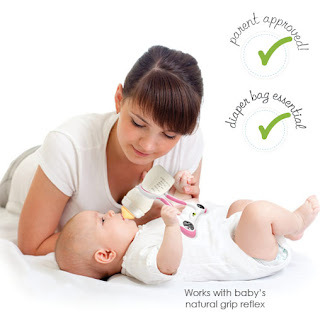 It works with baby's natural grip reflex to allow them to learn to hold their own bottles. It encourages development and matches baby's natural nursing posture. It even has little rattles on the end to entertain older babies while feeding. Lil' Helper fits most bottles, I recommend wetting the bottle or Lil' Helper to make it easier to slide on thicker bottles like the NUK bottles we use. Position the bottle how you need it and offer to baby, resting Lil' helper on baby. Baby can grab the gripped handles and practically feed themselves. It's great for growing families on the go like mine or families with multiples! Baby M is a little young at the moment to use something like this although we did try it briefly for this review, I would definitely recommend it to moms of older babies! It will come in really useful I think when we are out and about as Baby M gets older as Lil' Helper is great for the car seat, stroller or travel seat. Lil' Helper comes in four different colours and sells online for $14.99 on the Lil' Helper website! Show some love for Lil' Helper by liking them on Facebook! Disclosure: Posted by AME on behalf of Lil' Helper. We received a Lil' Helper bottle holder to simplify this review. Opinions and comments expressed on this blog are those of the author. My daughter doesn't use bottles, but my cousin's little guy does, and I know she could really use the extra hand! I would give this to a friend having twins. She will need the extra hand! ive got a little one on the way and with two other little guys in the house, im thinking this babe will have to be a lil more self sufficient!! This would be awesome for my friends little guy. I would use this myself as I am expecting at the end of the year with my first. This looks like it would come in handy! This would be helpful for our next one on the way.